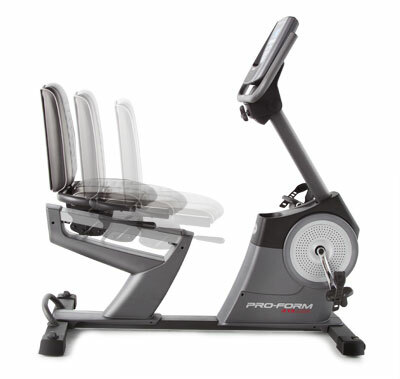 Get the ultimate in comfort and convenience with the ProForm 315 CSX Exercise Bike. With digital resistance, you can quickly adjust your workout intensity to meet your fitness goals. 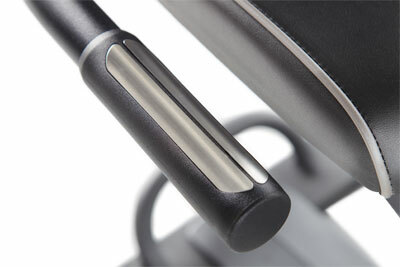 Adjustable, non-slip handlebars help you find the perfect fit. And, with iFit Live Technology compatibility, you can work out around the world with Google Maps, train with Jillian Michaels and get a personalized workout program downloaded every day – right to the bike’s console! Recumbent Frame: Engineered for comfort, this bike is designed with a recumbent-style frame that is easier to get on and off than a traditional bike frame. Grafixx Display: This attractive display can either show multiple information fields for more at-a-glance information, or show a single display for on-the-fly goal training. Track your speed, time, distance, calories and pulse. Adjustable, Non-Slip Handlebars: Ergonomically designed for comfort, the non-slip handlebars cut down on fatigue so you can ride longer. Plus, adjust your angle to find your perfect fit. 20 Personal Trainer Workouts: Burn fat, lose weight and stay motivated with Personal Trainer Workouts. Choose between aerobic, weight-loss or performance workouts and you’ll be on your way to results. SMR Silent Magnetic Resistance: This smooth, frictionless resistance system allows you to adjust your workout intensity without interrupting your workout. 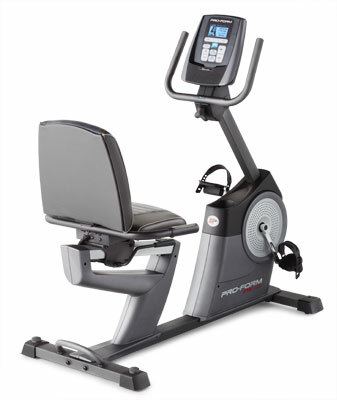 Adjustable, Oversized Seat with Lumbar Support: This adjustable seat is bigger and cushier than most to guarantee you not only have a productive workout, but a comfortable ride. 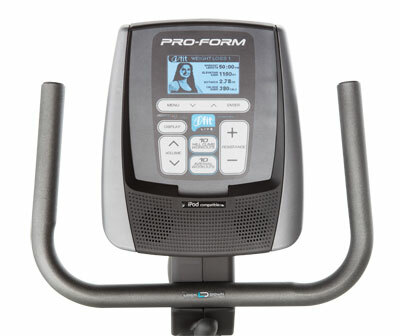 Power Output Indicator: This bike features a direct power (watts) measurement sensor. This console measures the load the rider drives into the system for an accurate reading. Intermix Acoustics 2.0 Sound System: Enjoy your favorite media with this built-in sound system that produces a broad range of frequencies and rich, equalized sound. 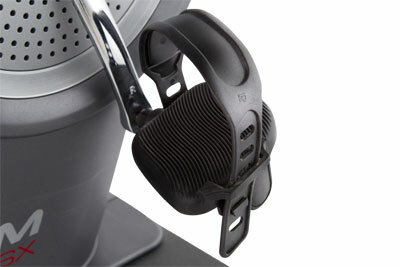 Compatible Music Port for iPod: Rock your workout to your favorite music. 300 lb. Weight Capacity: The ProForm 315 CSX accommodates up to 300 lbs. Warranty: 5-Year Frame Warranty and a 90-Day Parts & Labor Warranty. Across the street or around the world—you draw it and iFit Live Technology turns it into a workout! Powered by Google Maps, workouts recreate the route, automatically adjusting the incline to match the terrain. The 315 CSX Exercise Bike does what the street does! Choose a pre-drawn workout or draw a map anywhere in the world. Watch your progress on a Google Maps satellite, map or street view. Plus, compete against other iFit Live community members; race and compare your time with people from around the world. Lose weight with America’s Toughest Trainer, Jillian Michaels. The ultimate motivation, Jillian’s voice coaches you through your unique weight-loss program to help you burn calories, slim down and reach your goals! A new workout is automatically downloaded every day to the 315 CSX Exercise Bike. Each workout in your personalized 8-week program is progressive from start to finish and automatically controls your speed and incline to maximize your results! Track your nutrition, weight goals, event training and other activities on iFit.com. Your workout results from any map, Jillian Michaels or manual workout are automatically uploaded in real time to your personal profile. Plus, for extra motivation, you can share your workout and interact with your Facebook friends.